Would you believe me if I said Press E To is actually kind of powerful, even if it's suuuper minimal and based on a goofy moment from Call of Duty? In what has become probably Call of Duty: Advanced Warfare's most notorious scene, the player attends a funeral and has to "hold [button dependent on game platform of choice] to pay respects." It's a clumsy intersection of traditional video-game-y-ness and narrative, a crossing of the streams that ends in unintentional hilarity rather than tragedy. Even Conan made fun of it. To borrow phrasing from my good friend Morbo, FUNERALS DO NOT WORK THAT WAY. Press E To actually takes place a while after a funeral and aims to get your tear ducts gushing—or at least lightly spritzing, in the fashion one might apply vinaigrette to an appetizer salad. 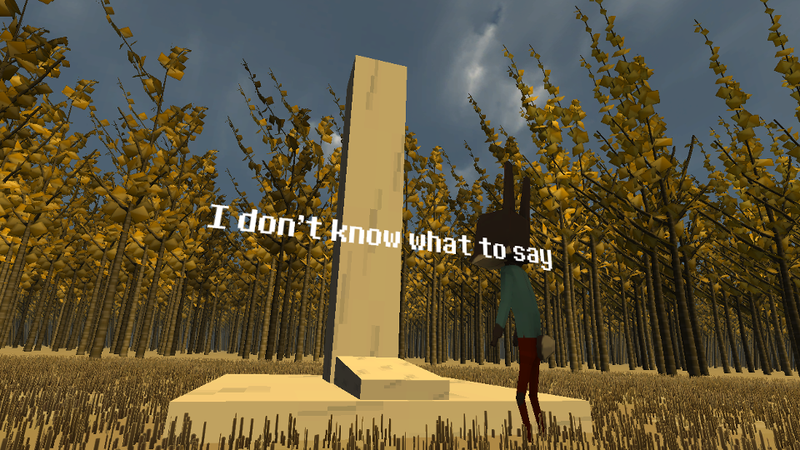 It's brief yet melancholy experience, a short forest stroll to a lonely grave followed by a not-quite-conversation. I won't spoil the content of the talk, but suffice it to say that it's meant to get you into the mindset of actual mourning, the aching regret and longing. Press E To isn't the most profound game I've played all year or anything, but it's an interesting little digital art piece and a look at what can actually be done with the sort of thing Call of Duty lazily glossed over. Personally I think there are better ways for video games to convey a character's grief (or any other emotion, for that matter) than a quick button press, but it is what it is. Now then, good graveyard games/games with graveyard scenes: go! And yes, I know about The Graveyard. Weirdly, it came up during a lesson in one of my college media courses once. I don't remember why.